Hurricane Arthur, which was weakened to a post-tropical storm, has battered south-east Canada leaving more than 200,000 homes and businesses without power. Nova Scotia and New Brunswick bore the brunt of the storm’s torrential rain and strong winds. Forecasters say Arthur will move north-east through the Gulf of St Lawrence towards Newfoundland on Sunday. On Friday, Arthur hit North Carolina with hurricane-force winds and later skirted New England. 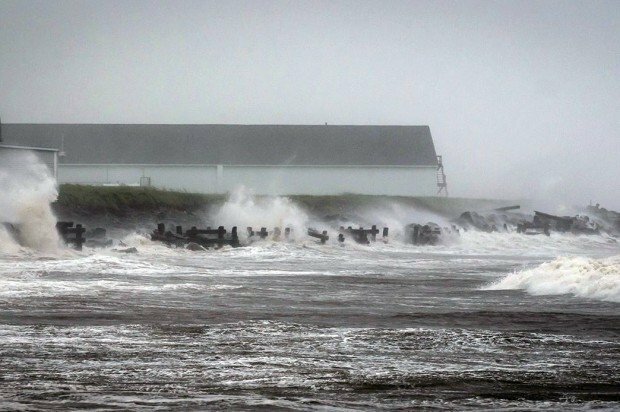 Late on Saturday, the Canadian Hurricane Center said Arthur was centered near Moncton in New Brunswick after making a second landfall in Canada. Trees were blown down and power was cut to more than 141,000 customers in Nova Scotia and 110,000 in New Brunswick. The largest number of outages was reported in Fredericton where winds of more than 62mph had brought down a number of large trees. Police in Saint John, New Brunswick, said some roads were closed by flooding. The storm also caused flight cancellations and delays at the region’s largest airport in Halifax, Nova Scotia. The Royal Canadian Mounted Police in Prince Edward Island said electricity poles had been knocked down and roads were blocked by fallen trees. New England was largely spared major damage although about 19,000 people in Maine and 1,600 in Vermont were left without power. Daniel Brown, a specialist at the US National Hurricane Center, said Arthur had now lost its tropical characteristics and had become “more a wintertime-type low”. Arthur was the first hurricane to hit the US since Superstorm Sandy devastated New York and New Jersey in October 2012.